Nexus Radio lets you listen to over 6000 streaming radio stations free of charge. As a bonus, recording songs is tightly integrated. 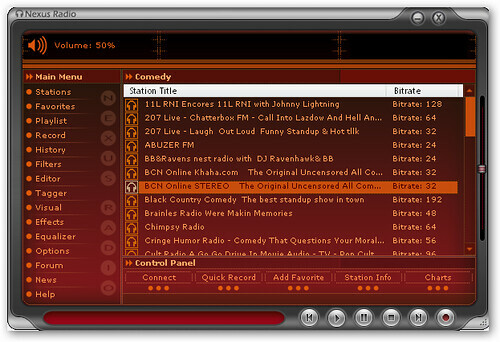 All you need to do is click the little red Record button once you find a good radio station. More advanced users can schedule TiVo-style regular recordings of particular stations and also set up Filters for automatic recording of tracks by song or artist. A simple audio and ID3 tag editor is also included. When you install Nexus Radio, it asks to install a toolbar in your browser. I suggest you uncheck that box. The other catch is that advertising is played 3 to 4 times a hour when you use Nexus Radio. A similar, but simpler, application is Screamer Radio. Thanks for the correction, Tim! I hope the Help section gets updated to reflect the new ad-free nature of Nexus Radio.